When the notorious bandit Willie Sutton was asked why he robbed banks, legend has it that he matter-of-factly replied, “It’s where the money is”. When Cliff Lee eventually signs his mega free agent contract, his motivation will likely be the same, but when it comes to money, baseball players aren’t always as honest as bank robbers. Just ask John Dillinger. He tried his hand in both professions. 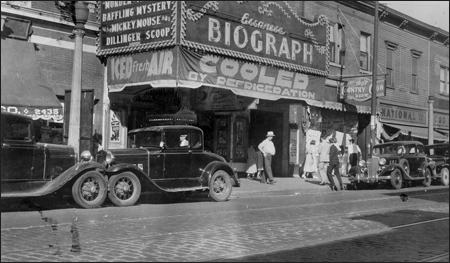 Dillinger was gunned down outside the Biograph theatre in Chicago. On July 22, 1934, the Yankees swept a doubleheader from the White Sox at Comiskey Park. In the first game, Babe Ruth pushed aside father time and an injured leg to knock in four runs and belt homerun number 702, one of his last in pinstripes. Meanwhile, over on the North side of town, the nation’s public enemy number one had decided to take in a movie at Chicago’s Biograph theatre. Unfortunately for Dillinger, as he and two female companions (his girlfriend and Anna Sage, the infamous “lady in red” who betrayed him) watched Clark Gable in Manhattan Melodrama, the FBI was waiting in ambush. Only moments after leaving the theatre, Dillinger was shot at least twice, including once in the chest and once in the back of the head. No longer the most wanted man in America, Dillinger’s lifeless body now laid face down in the street amid a pool of his own blood. Perhaps he should have gone to the baseball game instead? The idea of Dillinger attending the White Sox vs. Yankees doubleheader isn’t far fetched at all. During his time in Chicago, Dillinger was believed to have attended several baseball games, including a contest between the Cubs and Dodgers at Wrigley Field on June 26, 1933. According to eye-witness Robert Volk, Dillinger took a seat beside him in at the top of the bleachers before departing during the seventh inning stretch. 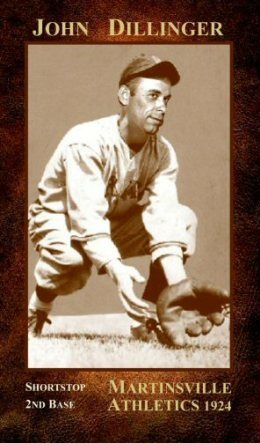 Dillinger depicted in a baseball card created by Dave Stewart, a Vietnam veteran who created several picture card sets to raise money for disabled American veterans. Anyone who had known Dillinger in his youth would likely not have been surprised that he had risked capture to take in a major league game. After all, aside from crime, baseball was perhaps Dillinger’s greatest passion. At various stages of his life, Dillinger not only played the game, but did so with notable accomplishment. His first known exploits were as a member of a local club in Mooresville, Indiana, the farming town where Dillinger’s family relocated. Part of the motivation for the move was the senior Dillinger’s attempt to get Johnnie, as he was known as a boy, to settle down and turn away from the life of petty crime that had dogged him in Indianapolis. Unfortunately for his father, Dillinger’s success as a second baseman and pitcher for the local team did little to curb his deviant behavior. Dillinger eventually joined and then deserted the Navy in 1923 before settling in Martinsville, Indiana and eventually getting married on April 12, 1924, just in time for the start of the baseball season. According to Elliott J. Gorn, author of Dillinger’s Wild Ride, the future bank robber was “good enough to pitch and play shortstop on a Martinsville semiprofessional team”. Even if Dillinger wasn’t really pro-material, he was certainly good enough to earn some extra cash playing ball. In fact, he even earned a $25 bonus from a local furniture store for being the best hitter on the Martinsville team. Unfortunately, when the season ended in August, Dillinger had little prospects for a job and no means to replace the income he had been receiving from playing baseball. 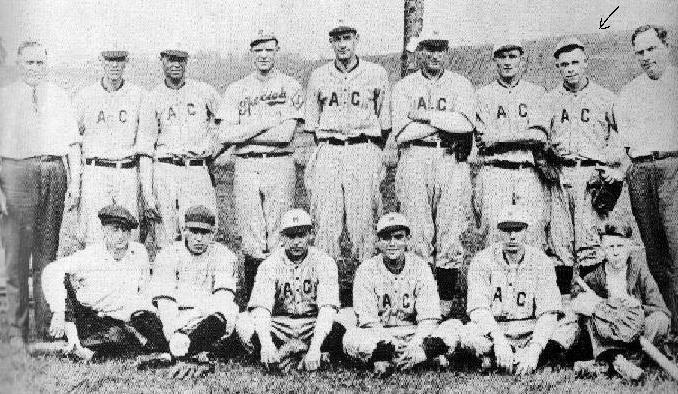 Dillinger (top row, far right) pictured with his teammates on the Martinsville, IN semi-pro baseball team. Even in his early days as a youth in Indianapolis, Dillinger was predisposed toward the wrong side of the law, but it wasn’t until meeting William Edgar Singleton (a distant relative of his step mother and umpire in the league in which he played) that his life turned down the path that would lead him to his demise outside the Biograph. Like Dillinger, Singleton was a petty criminal who was in need of some quick cash. According to most accounts, the older Singleton recruited Dillinger to assist in a stick up. The target was Frank Morgan, an elderly grocer who was known to carry the day’s receipts with him after closing up the shop. So, on September 6, the plan was hatched. During the attempted assault, however, Morgan managed to fight off Dillinger, discharging the latter’s gun in the process. Scared away by the shot, Dillinger fled on foot while Singleton sped off alone in the getaway car. Because of his odd behavior following the botched robbery, suspicion was immediately cast upon Dillinger, who, taking his father’s advice, immediately confessed to the crime with the hope of receiving leniency. There was none forthcoming. Dillinger was sentenced to 10-20 years in the Indiana State Reformatory. Meanwhile, Singleton, now being called the “accomplice”, was convicted of a lesser crime and only served two years. For the first time, baseball had steered Dillinger wrong. To that point, it had been a stabilizing force in his life, but now, thanks to the influence of Singleton, it proved to be his downfall. While in prison, however, Dillinger didn’t turn away from the game. In his attempt to be a model prisoner and earn an early release, Dillinger participated in several prison activities, but it was baseball that proved to be his greatest solace, especially after his wife served him with a divorce five years into his sentence. On the day before his first parole hearing, Dillinger played in a prison baseball game in front of Indiana Governor Harry Leslie, one of the men who would preside over his fate the next day. According to John Toland, author of The Dillinger Days, the convict played so well in the game that the governor told an Indianapolis reporter, “That kid ought to be playing major league ball”. The rest of the parole board apparently did not agree. His parole was denied. 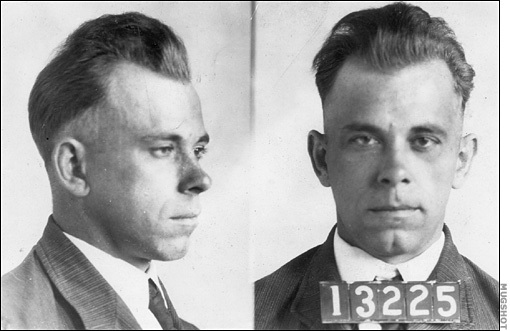 One of Dillinger's many mugshots. 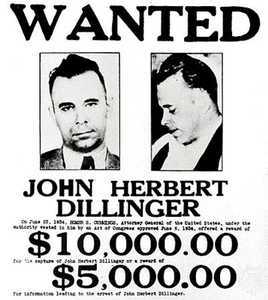 This is the point where most historians believe Dillinger, whose bitterness over the unfairness of his sentence was now compounded by the denial for parole, crossed over the edge. However, despite his shock over the decision, baseball still wasn’t far from his mind. When asked if he had anything to say before returning to prison, Dillinger requested a transfer to the Michigan City State Penitentiary. Confused by the odd preference for a tougher prison, a trustee on the board asked why. “I want to go up there and play baseball. They have a real team,” Dillinger replied, according to Toland’s book. With prodding from Governor Leslie, Dillinger’s request was granted. Life at the state penitentiary wasn’t what Dillinger expected, and he soon came to regret his decision, even going so far as to convince himself the denial of his parole and subsequent transfer were really motivated by the board’s desire to have him play shortstop for Michigan City. When baseball stopped being his favorite prison pastime, it was replaced by the lessons in a criminal lifestyle being offered by fellow inmates like Russell Clark, Harry Pierpont and Homer Van Meter, all of whom would eventually join Dillinger’s notorious gang. Any fanciful notions about playing profession baseball were now replaced by plans for a future of robbing banks, but Dillinger still needed to be released from prison to put his new ambitions into action. The opportunity finally came on May 10, 1933, when he was granted parole. Almost immediately upon being released, Dillinger returned to a life a crime, adding bank robbery to his already lengthy rap sheet. Once again, however, he was quickly captured and pled guilty to the charges. While awaiting extradition to the Ohio state penitentiary in Columbus, Dillinger penned a letter to his niece, with whom he had developed a strong bond, and expressed as one of his regrets his inability to drive to Washington and New York to attend the World Series being played by the Senators and Giants. Dillinger never made it to Columbus. On October 12, his fledgling gang was successful in breaking him out of prison, setting in motion a crime spree that included dozens of bank robberies and nearly as many murders. Unfortunately for Dillinger, however, the escape didn’t happen until five days after the Giants bested the Senators in the World Series. Who knows…if not for Dillinger’s ill fated decision to rob a grocery store, one of the most notorious criminals in the nation’s history might have been better known for his contributions to the national pastime? Instead of robbing banks, he could have been stealing bases. Instead of knocking over police stations, he could have been knocking balls out of the park. Instead of gunning down law enforcement agents, he could have been throwing out base runners from the shortstop hole. It’s probably a leap to suggest that baseball could have been Dillinger’s salvation, but it does seem to be the only influence that could have steered him away from a life a crime. However, in an ironic twist, baseball actually helped lead him down his ill-fated path…one in which sliding into home was replaced by laying in a pool of blood on the corner of Fullerton Street and Lincoln Avenue. John Dillinger was a ball player, who’d a thunk it? Hello there, I found your blog by means of Google whilst looking for a comparable topic, your site got here up, it appears good. I have bookmarked to my favourites|added to bookmarks.